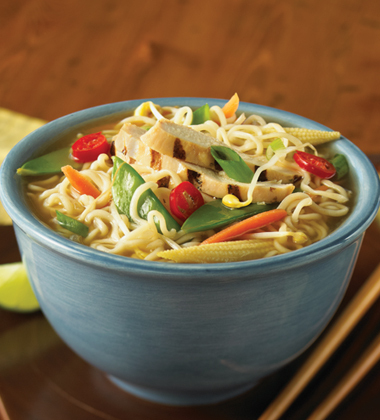 Add some Asian influence to your menu with this hearty noodle bowl loaded with chicken, noodles, vegetables and Shiitake mushrooms and flavoured with just a touch of ginger, Ponzu and lime. 1. Bring stock to the boil and add carrots, mushrooms, baby corn and ginger. 2. Simmer for 3 minutes. 3. Increase heat. Add chicken, noodles and remaining ingredients. 4. When the stock boils, remove from heat and serve with lime wedges.